Please refer to our stock # jk1 when inquiring. 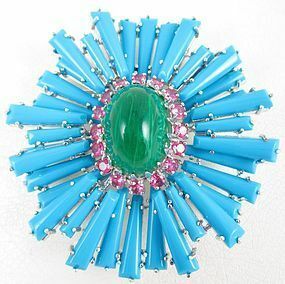 This amazing statement brooch was designed by contemporary designer jeweler, Jarin Kasi, and obviously inspired by the classic ruffle pin by Schreiner of New York. It is 3 1/4" long x 3" wide and is made from rhodium plated sterling silver. It has a green faux included emerald cabochon center in a red CZ frame, and a fan of turquoise glass stones fan on the outside. It is incredibly dimensional and will get many a compliment when worn. It has a secure pin stem and also has a bale so it can be worn as a pendant. It is in excellent condition and is signed "Jarin" on the reverse.